After a brief Wall Street stint in 1996, Kasian set sail on a journey into prosperity he never looked back from. He bought his first home for only $100.00 down, took over a non-qualifying loan, and the owner wrote him a thank you letter! Nationally renowned real estate “gurus” personally handpicked him to teach seminars featuring hundreds at a time. He co-authored the book Auction Fever: Winning Strategies to Buy, Sell, and Rent Real Estate with New York Times bestselling author and international real estate mogul Dr. Dolf de Roos. He has personally participated in and assisted his students with hundreds of profitable transactions. Drawing upon his world-class insider contacts, he actively writes, host teleseminars, and mentors others with proven, profitable strategies you can put to use immediately during these changing times. These strategies include how to trigger a bidding frenzy for your home no matter what the market; how to stop foreclosure and turn the tables on banks, stay in your home rent-free for months or years, and ultimately slash your mortgage balance and interest without the hassles of short sales or loan mods (which don’t work anyway); how to delete negatives off your credit report, and even possibly get a check from the credit bureaus for damaging your credit. 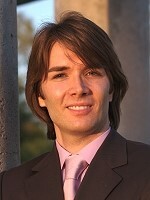 Stefan Kasian, Ph.D. is Professor of Consciousness Studies in Akamai University, in Hilo, HI. His training in psychology gives him unique intuitive insights into human interactions, to give you an advantage in your dealings with others and increase your profits. A Naturopathic Medical Doctor candidate training at the Southwest College of Naturopathic Medicine in Tempe, AZ, he is passionately studying hard-core medical sciences, but from a perspective that includes nutrition, common sense natural and preventative approaches that actually work today where much conventional medicine fails to help people live safer, healthier lives. He firmly believes that to fully live and enjoy your prosperity you need the highest, most radiant health possible.